During the 1960s, leaders of the U.S. federal government worried about the spread of communism in Southeast Asia. It was, at least theoretically, the reason why several presidential administrations turned their collective attention to Vietnam. Not only did they turn their attention to countries in Southeast Asia—such as Vietnam—several U.S. Presidents sent military men to support one side of Vietnam's civil war (South Vietnam). First Americans served as unarmed advisers and non-combatants. Then they served as armed advisers and fully-engaged combatants. Editorial cartoon shows President Nixon and a military officer walking past a graveyard labeled "Viet War Dead," filled with gravestones looking like dominoes. A vulture watches from a bare tree branch. The officer lectures the President saying, " ... and, of course, if Cambodia fell then Laos would fall, and if Laos fell ... ."
This political cartoon zeroes-in on the domino theory but gives it a different (almost back-firing) application. To prevent the “domino theory” from harming the countries of Southeast Asia, the U.S. federal government sent hundreds of thousands of American servicemen to fight in Vietnam. Of those individuals, 58,286 (at least) died as a direct result of that war. Marlette drew cartoons for the Charlotte Observer and other southern newspapers from 1972 until his death in 2007 and won the Pulitzer Prize in 1988. He also drew the popular comic strip Kudzu. Which, do you think, is the better application of the domino theory? Marlette—like other political cartoonists who are able to visually depict conflict in a single illustration—also turned his sights on President Ford. After the fall of Saigon, in late April of 1975, Ford refused to open an investigation into what had gone wrong in Vietnam. Perhaps, wondered Marlette, Ford had spent a lifetime making wrong decisions? 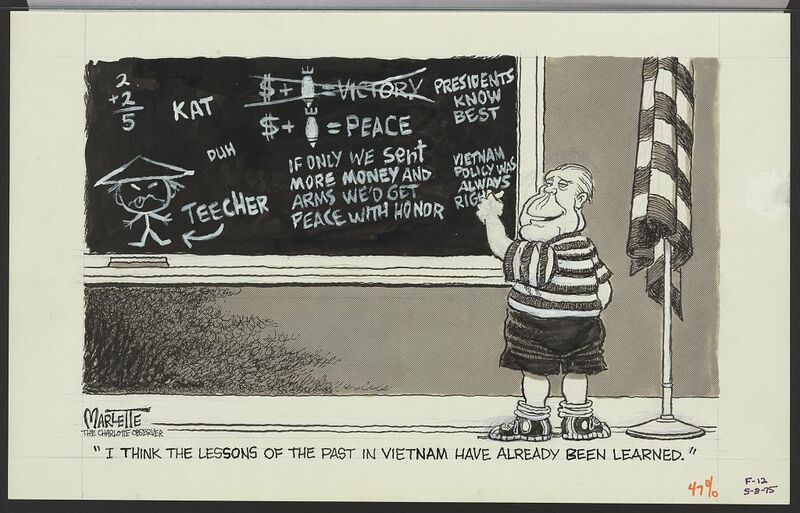 Marlette's editorial cartoon, depicting Ford saying that "the lessons of the past in Vietnam have already been learned," expressed the frustrations of many Americans at the time (and later). Political cartoon, by Doug Marlette, created circa 1972. Online via the "Art Wood Collection of Cartoon and Caricature" at the Library of Congress. Bos, Carole "Domino Effect: If Cambodia Fell, then Laos..." AwesomeStories.com. Feb 18, 2016. Apr 20, 2019.